Singular nouns name one (single) person, place, thing, animal or idea. 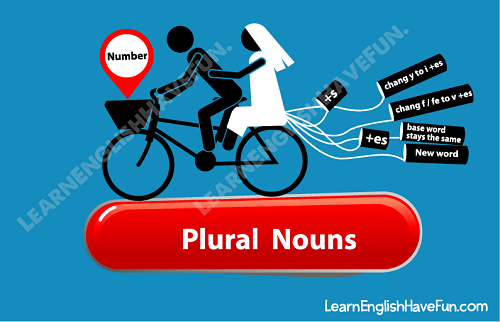 Plural nouns name more than one person, place thing, animal or idea. (By the way, for an overview of all the different types of nouns, click here). 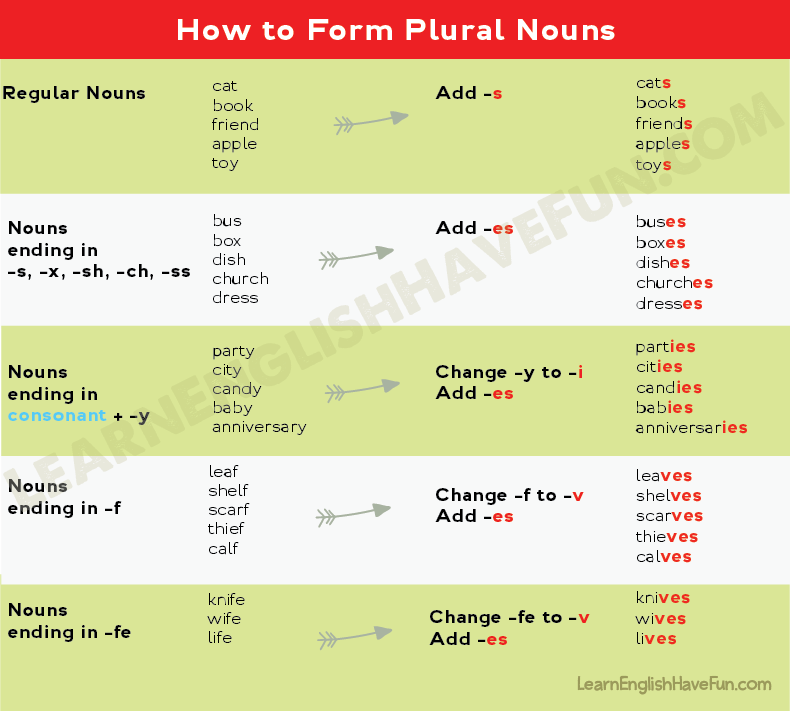 Although we add -s to change most singular nouns to plural nouns, there are many nouns that have a different ending in the plural. I know what your thinking...aaarrghh! The reason many of these have spelling changes is to make them easier to pronounce. For example, if the plural of "bus" were "buss" it would either sound strange or we'd have the same sound. "Buses" is much easier to pronounce. Look at the end of the word and if it ends in the letters above, you add an -es. If a noun ends with a consonant plus a -y, then change the -y to an -i and add -es. If a noun ends with either -f or -fe, change these letters to a -v and add -es. *Note: Unfortunately, there are a few exceptions to this rule. Sorry, you'll have to memorize them (see some examples below under irregular plural nouns). The chart below can help you remember these few rules. Some nouns just don't follow any of the rules above when changing from singular to plural. I know, bummer. You'll have to memorize these or consult your good friend, Miss Dictionary, if you're unsure. Some nouns that end in -o add an -es. You'll have to check your dictionary to be sure of the spelling. Look carefully at these as sometimes there is only one letter that's different (e.g., man, men). The reason that some of these nouns completely change their spelling is that some of these words are borrowed from Latin or Greek. We use the following always in the plural form. Many of these things are a single item that has two connected parts. For example, clothing items that cover the bottom and have two parts for each leg (e.g. pants, shorts, pantyhose). Also, some tools that have two blades or parts are plural. I need to buy a new pair of sunglasses. I need to buy some sunglasses (not I need to buy a sunglasses). Finally, be careful not to confuse plural nouns with possessive nouns. There are two trees in the yard. (two trees = plural of tree). The oak tree's leaves are falling to the ground. (possessive: the leaves belonging to this tree are falling). Both trees' branches are very long. (both trees possess long branches). Remember that the possessive uses an apostrophe + -s after the noun. Plural nouns do not use an apostrophe.